ANA Intercontinental Manza Beach Resort is located on a narrow peninsula. The resort’s specialty is fun on water. Submarine Jr. II is a very good experience for kids, and a good study of ocean life. Some activities require advance reservations, and details are posted on the resort website http://www.anaintercontinental-manza.jp/. The website is in Japanese, English and Chinese. The beach has a long stretch of fine sand. Yoshio Kaneko, the senior marketing manager at the resort says, “We welcome all to enjoy all of our facilities and equipment. Just come and have fun at the beach, pamper your palate with a delicious meal, relax in the spa or just have a good time at the poolside. We are happy to be able to help you relax and have a good time at our resort. I’m looking forward to your visit for a special time with us!” He further explains that the hotel has many packages for special events like weddings, meetings, and parties. Restaurant Orchid offers daily Ryukyu-style entertainment and dining. 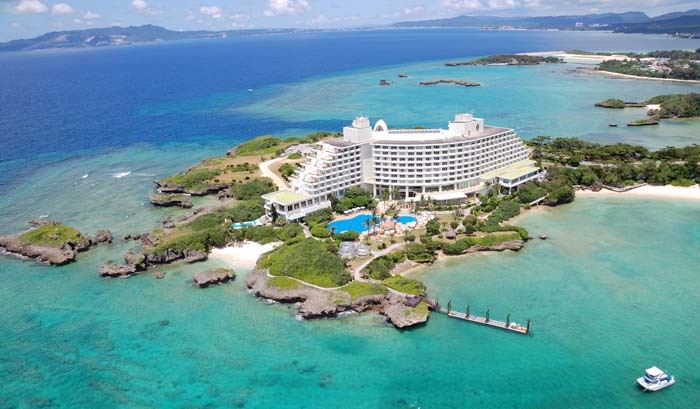 Manza Beach Resort has available a number of overnight or longer-term stay package, and features a variety of restaurants including Salvatore Cuomo & Bar, which serves fresh oven-baked Napoli Pizza, and The Orchid that offers Ryukyu style dining, entertainment and local delicacies. The Urumo Spa is designed for relaxation time, and the beach side Bar Wavy is a popular spot to just slow down and relax. 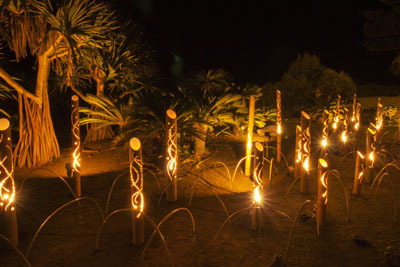 The paths on the resort property are romantically illuminated for evening walks. The resort has special package plans for each season of the year. Currently, they are offering a Christmas program called “Manza Blue Xmas.” During the month of December through Christmas, the restaurants have Christmas-themed lunch and dinner specials, illumination and projection mapping shows. 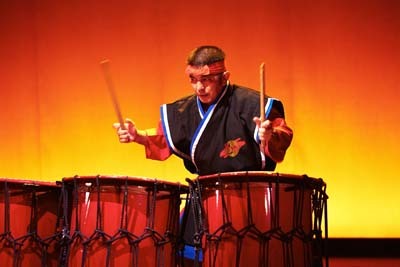 On Dec. 23rd, 24th and 25th there are live concerts and fireworks. Staying at the hotel is great, but just visiting and enjoying the wide range of activities is also fun for Okinawa residents! As a special treat, persons over 65 years of age get a 50% discount on lunch at Restaurant Aqua Belle.